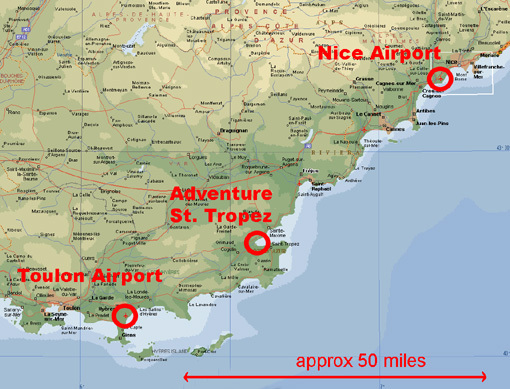 Transfers from Nice Airport (60 miles away) take about 1 hour 30 mins to St.Tropez in our minibus van. It takes slightly longer by bus or train, depending on connections and traffic. If required, we will transfer our clients to and from Nice airport as efficiently as possible. Co-ordination will depend on arrival / departure times and numbers involved. Details of the transfers will be agreed nearer the time and the following nominal charges will be applicable. The rate is £30 per person, each way. ( x2 for return trip ). You may have to wait for other group members on other flights (ask Matt). Public Transport is a little cheaper and an easy, alternative option. This option is probably best for guests arriving at non standard times. Or for mid-week arrival days. We normally allow 3 hours for travelling and check in time for departures so please avoid early morning flights. Ideally choose late morning arrivals and afternoon departures. Please note – We are not responsible for late arrival and airport departures. Clients must agree their own journey times and traffic allowances. You are advised to check that your travel insurance covers missed flights through unforeseen hold-ups ( they normally do! ). It has never happened yet but is a possibility! Our transfer costs are just a little more than Public Transport which is an easy, alternative option. If you choose to use Public Transport or circumstances dictate that it is the better option, then read the following suggestions. We use the buses & trains all the time and find it no problem . For small groups, renting a budget car can be cheaper than our transfers or why not Hire a Car ONE WAY ONLY dropping it off in St Tropez. We will collect you from St Tropez. Quite a good solution to transfers for weekend Hen Groups. Affordable by small groups, and gives complete freedom for evening travel and Airport returns. Will add flexibility to week bookings but not essential as all activities are based at the marina, and beaches, supermarket, restaurants and shops are within easy walking distance. St.Tropez is normally reached by boat or bike. Most Car Rentals are based close to Terminal 2 within short walking distance. If you drive you should take the Autoroute A8 ( direction Marseille & Antibes ), which will cost about £3 in peages. Leave the A8 at the Frejus/St.Raphael turnoff ( Junction 38 ) and after driving the short distance from the autoroute to Frejus, you drive the rest of the journey along the N98, the fabulous coastline, always following the St.Tropez signs. Check out ‘final approach’ (link above). Easy enough. Clear baggage and customs, then come out into the main arrivals hall. Turn left and walk 50m to the end, go through the glass doors and you are in the Bus Station. Ticket office is just on your left. Wait at the stop appropriate for St Raphael. From baggage walk straight ahead in the main arrivals hall and out through the glass doors. The bus terminal is outside, across the road and to the right. Terminal 1 seems to have a better choice of buses and a bigger bus station so it might be worth catching the FREE terminal shuttle (every 10 mins). This shuttle is also useful for groups who arrive at different Terminals on different airlines, for getting together. The bus travels along the A8 Auturoute to St.Raphael. Change at the St.Raphael Bus Station for St.Tropez (normally it is the 1st bay). You will need to ask for La Foux, Marines de Cogolin. La Foux (pronounced ‘la foox’) is where the Geant Hypermarket and MacDonalds is, and the bus stops just after the St Tropez exit sign opposite MDA Electrical shop. Don’t be alarmed if the bus goes off to the villages of Grimaud and Cogolin before coming back to La Foux. The whole trip costs about £20 from Nice. When you arrive best to call 0033674747257 walk across the road to MDA and wait there, we will come and pick you up. Better connections and the train journey is picturesque. As above but go to the bus stop appropriate for the main Nice Train Station, Gare SNCF ( ‘Gare’ is french for station) and pay on bus (approx £3). Get a connection to St.Raphael, then take the bus (as above) to St.Tropez, getting off at La Foux / Marines de Cogolin, of course. : The Train and Bus stations at St.Raphael are next to each other and connected by footbridge. The bus journey from St.Raphael to the Gulf of St.Tropez is stunning! Cost of whole trip is about £20. Walk 10 minutes or less from Nice, Terminal 1, to the SNCF train station of St.Augustine. The station is 1 stop less than going to Nice itself, but the station is not in a pretty place, a bit ‘downtown’. Quicker, cheaper, more direct but not so pleasant and not all the trains that go from Nice to St Raphael stop here. Take the train to St.Raphael and bus to St.Tropez as above. The way to St.Augustine station is from Terminal 1. Out of baggage, go straight on, out of arrivals, through glass doors. (do not turn left to the bus station). Walk straight ahead past the entrance to yet more car parks and under the road bridge ahead, then up to the roundabout. Turn left and go 500m to traffic lights at end of road. Turn right on bigger road and go to the complex flyover junction another 500m further along. Use several pedestrian crossings to get to the station on the other side, which is just up a short road. Just look for the railway! If you have any doubts then use Google Maps and Street View to rehearse the route. Travel light because it’s a 10 minute walk from the main road, around the marina, to the apartment if we can’t come and get you ! Taxis are too expensive from Nice, but there are a number of people who offer their services for airport pickups. They charge around 160 euros and can take 4-5 people. We can provide telephone nos. if required. 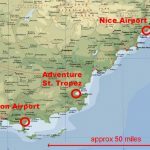 Here is a useful website for Nice Airport, it gives access to transfer information etc, but because time tables are seasonal, it’s probably better to get there and compare the options above.